We could see butterflies gently swing in the breeze. Fit for plant pots, flower beds,garden decoration or other. and will work hard to earn your praise. Canada and most other country! Butterfly width: Approx4 cm. Butterfly size: 6.8 5.5cm. 3: Colors on your computer monitor may differ slightly from actual product colors depending on your monitor settings. maybe color and size of physical goods are different from the picture ，the color depending on your monitor settings. The combination of colorful beautiful butterfly stickers will make your house or bedroom modern and beautiful. 20 Pcs Butterflies on Sticks. 4 PcsDragonflies on Sticks(Not include any other accessories ). 25 x Butterfly On Sticks. Butterfly Width: Approx. Commonly used to decorate the flowerbeds, plant pots and terrace. Place them in indoors and outdoors. Ideal for plant pots, flower beds decoration or other. 10 pcs Beautiful Butterflies on Sticks Window Box Pot Plant Decoration Craft 7cm. Beautiful butterflies on sticks. 10 Pcs Butterflies on Sticks. The butterflies are attached to a small spring at the top of the stick so that they can move freely. Double Layer Butterfly On Sticks Lawn Flowerpot . Creat romantic and comfortable atmosphere for you. 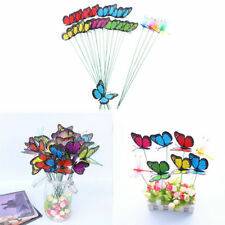 1 25pcs Butterfly On Sticks. Butterfly Width: Approx. Color: Sending Randomly(Multiple colors and randomly sent, you may get different colors from the pictures or repeated colors. ). However, if you can send the order to your country faster then we will use it. Commonly used to decorate the flowerbeds, plant pots and terrace. 1x 25 pcs Butterfly On Sticks. Butterfly Width: Approx. Stick Length: Approx. We could see butterflies gently swing in the breeze. Fit for plant pots, flower beds,garden decoration or other. and will work hard to earn your praise. Canada and most other country! Butterfly width: Appro 4cm. Model Number: garden decorations. Material: other. Model Number:Garden statues. Color:Random color. The combination of colorful beautiful butterfly stickers will make your house or bedroom modern and beautiful. 1 x Butterflies on Sticks. Unit Type: piece. We could see butterflies gently swing in the breeze. Fit for plant pots, flower beds,garden decoration or other. and will work hard to earn your praise. Canada and most other country! 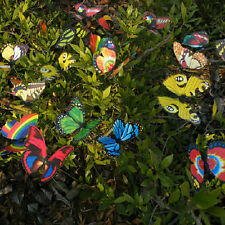 Multicolor Garden Butterflies on Sticks x10. Dia 7cm;Single layer butterfly P9I2. colour: Multicolor. The butterflies will be randomly 10pcs selected from a large selection of beautiful colours and designs, cannot be chosen. 10x Butterfly On Sticks. Butterfly Width: Approx. We'd like to settle any problem in a friendly manner. We want to make sure you are happy with our item. Goods without RMA number will NOT be accepted. This sheep is designed with grey cotton and has four stick legs. -Grey Cotton Sheep Design. -A Perfect Irish Gift. Product DetailsCondition Great Support. 10pcs Colourful Flower Pots Garden Butterflies on Sticks 25cm Long Dia De. Stick Length 25cm. Bright and cheerful butterflies that are. window boxes to add vibrancy and fun to the display. The butterflies are. fixed onto sticks so they can be placed in flower beds, pot plants and. MATERIAL: The wings of these butterflies and dragonflies are made of PVC material with good water resistance, suitable for both indoor and outdoor application,the colorful butterflies and dragonflies are attached to a small spring on the top of the stick, are not easy to fall down. Model Number:Butterfly Garden Decoration. Butterfly Width: Approx. 10pcs Butterfly. fixed onto sticks so they can be placed in flower beds, pot plants and. Butterfly full wingspan 8cm. Butterfly is made from plasticated card so. Stick Length 25cm. will be fine in all weather (except for strong wind). Bright and cheerful butterflies that are. window boxes to add vibrancy and fun to the display. The butterflies are. fixed onto sticks so they can be placed in flower beds, pot plants and. Butterfly full wingspan 8cm. This sheep is designed with white cotton and has four stick legs. -White Cotton Sheep Design. -A Perfect Irish Gift. Product DetailsCondition Great Support. Model Number:Butterfly On Sticks. Butterfly width:About 10cm. Color:Random color. Commonly used to decorate the flowerbeds, plant pots and terrace. Butterfly Width: Approx. 1x 25 pcs Butterfly On Sticks. Stick Length: Approx. Quanity: 25Pcs. Model Number: Butterfly Garden Decor. Feature: Garden Supplies. Ideal for plant pots, flower beds decoration or other. Beautiful butterflies on sticks. 10 Pcs Butterflies on Sticks. The butterflies are attached to a small spring at the top of the stick so that they can move freely.